Last week, I posted a personal vision statement for Jewish education. Over the coming year, I will offer suggestions as to how this vision can be implemented based on examples from my work at Congregation Emanu-El of the City of New York. In so doing, I want to emphasize that collaboration is the cornerstone of our methodology, and I am reporting on the intersection between my philosophy and the work we do, not taking credit for our achievements. 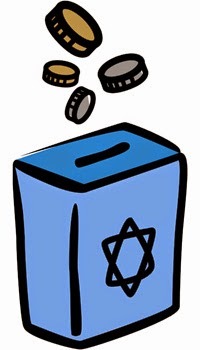 I begin with a look at how we teach about tzedakah. I think this is something most of us working in supplementary school education get right. This is, to my mind, a clear way to demonstrate the critical role of Jewish education not only to guide value-driven practice and participation in Jewish community (as if those weren’t enough! ), but also to offer unique ways of engaging the world. At Emanu-El, we teach that the Hebrew word tzedakah literally means, not “charity” (from the Latin “caritas,” “altruistic love”), but “justice.” On our website, in our classrooms, and through family programming, we emphasize that sharing our good fortune equitably with others is not only an act of compassion, but a responsibility. We show how our tradition teaches that our achievements are always dependent upon Divine providence, and that with our wealth, we must seek equity. Further, we emphasize how this sense of responsibility has always, and continues to play, a central role in our communal identity. Each Fall, our student council (composed of students in grades 4 – 7) debates the relative merits of different causes and selects two organizations to be the recipients of the funds we raise. Members of our high school A-TEEM (“Assistant Temple Emanu-El Madrichim”) then teach the students about the work of these organizations. Students are encouraged to bring tzedakah every week, and we regularly announce (and celebrate) where our fundraising stands. This collection fits into the framework of life that the parents live, many of whom are philanthropically minded. The student council also runs a booth at our Purim Carnival to teach about (and raise funds for) these causes. Yet, there are also times when we, as the school leadership, decide where the funds we raise must go. Our first beneficiary every year is New York Common Pantry, so that we may take action on hunger locally, in our immediate neighborhood. Most years, we (sadly) have at least one week in which tzedakah is diverted for an urgent response to an emergency, such as typhoon Haiyan or super-storm Sandy. Thanks to the suggestion of a religious school parent, during the week of Yom HaShoah (Holocaust Remembrance Day, April 8) our collection supports The Blue Card, an organization that provides financial assistance to destitute Holocaust survivors. By sharing with our children the causes that matter to us, we pass along our values to the next generation. Our students not only raise funds, they also provide direct assistance to those in need. Through the Emanu-El Tikkun Olam Committee, we run “Mini-Mitzvah ” projects prior to the start of school and during school hours over the course of the year. Social justice becomes the central focus of our 7th grade Mitzvah Corps. Throughout the year, these students learn about different social issues and then volunteer in agencies that respond to them. However, we do not want our children to grow up to be “mitzvah dilettantes,” believing that a single act of volunteering can address deep need. Therefore, the students who participate in at least 18 sessions during the course of that year (the “Mitzvah Messengers”) decide together which cause they will focus on as 8th graders in our Tzedek League. These students examine the root causes of social inequality and injustice, and respond through direct service, philanthropy, and advocacy (by lobbying a city council member or state senator about legislation that can address the issue they have chosen). As Jews, when we give tzedakah, what we do looks like what others are doing when they give charity. The critical point is that we understand it differently. At Emanu-El, we believe that our students are learning that with privilege comes responsibility. Our young people understand that it is their responsibility, as Jews, not only to study but also to act upon their beliefs. Our students become both advocates for causes they believe in and philanthropists on their behalf.